Players in Protection, Vacation and Penalty modes cannot be attacked. If the target player is marked with (i), this means that all players can attack him without any limitations. Exception of the rule are the inactive Bulfleet Generals with a protective mode for 20 days from the time of last activity unless their Bulfleet General status expires before day 20. 3. You can’t attack without ships. 4. You must have enough gas at the attack’s start planet in order to fuel your ships. If an attack is launched, that amount of gas is unredeemable no matter if the attack reaches its target or not. What happens when I attack? The idea is to steal resources from your opponent or to destroy his ships or defence turrets with a creation of a recycle field goal. If there aren’t any ships or turrets on the defender’s planet you just steal resources if any present. In other way you encounter a battle with his fleet and/or defences. Case 1: Ships vs. Ships. 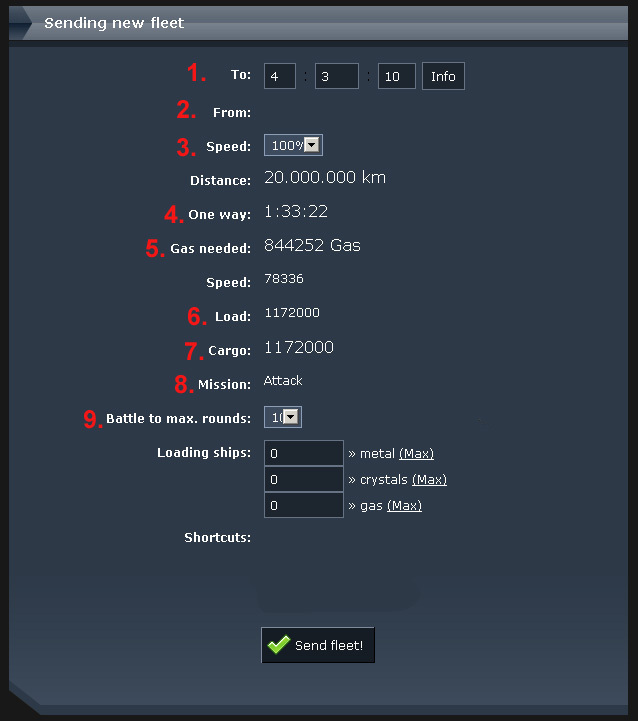 The battle order is random except cargo ships and satellites. They always fall last. The recycle field is a percentage of the total lost ship structure in that battle from both sides. It is always with 2:2:1 metal:crystals:gas ratio. Case 2: Ships vs. Ships + Defence turrets. In that case he battle order for the defender is 1st line – ships, 2nd line – defences. To destroy the defences, you must destroy the ships first. At the end of the battle 60% of the destroyed defences are restored. E.g. if the defender had initially 10 Laser beacons and they are destroyed, after the battle 6 of them will reappear on his planet. The recycle field includes a percentage of the remains of all lost ships and the lost 40% of the defences with ratio 2:2:1 again. Have in mind that the recycling ships are much slower than the other ships, so sending them to the future battle coordinates will be a benefit. That flight does not appear at your opponent’s Overview screen. How much I can steal? Not more than 50% of all available on the target planet per attack. You steal resources in that order: First up to 50% metal, then up to 50% crystals and at the end up to 50% gas. If you want to sweep someone’s planet, launch few attack waves with descending number of ships according his resources. E.g. if there are 1 000 000 resources and some ships, send your warships with the first attack with total cargo hold at least 500 000 to ensure the safe passage of your 2nd attack with cargo hold of 250 000 and 3rd attack with cargo hold of 125 000. A mixed fleet flies with the speed of the slowest ship in the formation, so check the flight times of your waves and ensure that the timing will be correct. Don’t forget about the 60% recovery of the defence turrets. How to launch an attack? If you have chosen your target already, it is time to launch your attack. There are two ways to do that. The first one is to go to Galaxy menu upon his coordinates and press the icon . next his name. You’ll be transferred to Fleets menu with his coordinates memorized by the system. Choose your attacking force (“Max” button selects all available ships on your planet). After that from the drop down menu choose mission type “Attack” and press the “Give order” button below. Now you are transferred to the next screen, showing you the following features: 1. Coordinates of the target. If you didn’t use the icon , now is the time to enter manually his coordinates. Take in mind that this field keeps the last used coordinates. If you don’t use the icon , the coordinates there are left from your previous target and are kept until you use the to launch new attack or until you restart your browser. So if you launch another type of flight, watch for the coordinates. 2. Name and coordinate of the attack’s starting planet. 3. 3. This is the flight speed. You can manage your speed according the time below. You can adjust your flight speed and time of arrival. If you choose a lower speed, that will save you some gas, but it will take more time for your fleet to reach its target and then return. E.g. change the speed to 80% and click somewhere aside in the screen and see how the time changes..
A common and useful practice in the game is sending your whole fleet with low speed and your resources loaded into your fleet to attack an inactive player. If you intend to be away for 10 hours, set the time of arrival at the target to 5 hours. That way you ensure the safety of your ships and resources until you return. 4. Flight time in one direction. 5. Gas consumption. 6. Resources, loaded in your fleet upon leaving. 7. Total cargo hold of your fleet. 8. Mission type. A second check is always useful. 9. Rounds of the battle. You can choose from 6 to 12. The standard Bulfleet battle lasts 10 round. Sometimes for tactical reasons you can select 6, 7 etc. in order just to cripple your opponent or 12 for a full victory, unachievable in 10 rounds. Use the Calculator for that purpose. v Now you are ready and press “Send fleet!” button. 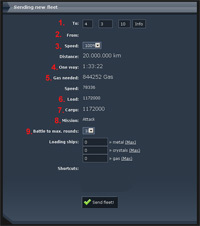 You can track your attack at “Overview” or “Fleets” menus. Now both you and your opponent have the attack on the “Overview” menu regardless of your Espionage levels. Exception of the rule is the Bulfleet Widget, If the target player has a Espionage level lower than yours, he does not receive a notification for the attack on his Widget screen. According to Point 9 or the Game Rules, sending and immediate returning of numerous attacks with sole purpose of sending an SMS to the target player counts as an SMS-flood and may lead to a punishment to the attacker after a case check by the Administration. When your opponent receives a SMS alert? After a successful launch, you are transferred to the next screen with information whether your target has received a SMS or not. If he does, probably he will login in his account and he probably will react adequately. That means that he has equal or higher Espionage level than yours, he is a Bulfleet General and in his “Options” menu he entered a valid mobile number or email with mail-to-SMS function. But sometimes players with higher Espionage level willingly do not enter either valid number, or they are not Bulfleet General, or by some other reason they don’t want to receive SMS-alert.